Blunt traumatic aortic injury (BTAI) patients are severely ill, with high mortality and morbidity. As 60% of BTAIs occur in the distal arch, left subclavian artery (LSCA) management is determined without knowing posterior cerebral or left arm circulation in emergent cases. Because we perform thoracic endovascular aortic repair (TEVAR) + debranching technique for thoracic BTAI, we assessed efficacy and safety of debranching TEVAR in BTAI patients. 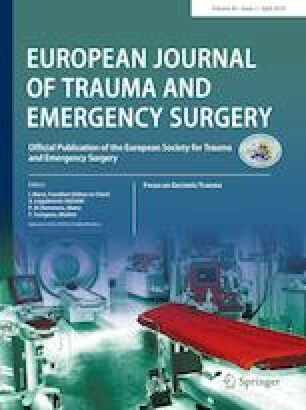 We retrospectively reviewed vital signs on arrival, injury mechanism, characteristics, clinical time-series, concomitant injuries, injury description, operative procedures, and results from patient records. We excluded patients in cardiopulmonary arrest on arrival. From April 2014 to December 2018, nine of 25 patients admitted with BTAI underwent TEVAR. Median Injury Severity Score was 34 (29–34) and probability of survival was 0.82 (0.16–0.94). Society for Vascular Surgery BTAI injury grade was III or IV in all patients. Three patients underwent simple TEVAR and six underwent debranching TEVAR (LSCA occlusion + left common carotid artery to LSCA bypass). Median operation time was 108 (75–157) min for simple TEVAR and 177 (112–218) min for debranching TEVAR. Concomitant injuries included intracranial hemorrhage (N = 1), intra-abdominal injuries (N = 3), pneumo- or hemothoraxes (N = 4) and pelvic/extremities fractures (N = 7). Only one complication of left-hand claudication occurred postoperatively in a patient with simple TEVAR with LSCA occlusion. Despite debranching TEVAR taking approximately 60 min longer than simple TEVAR, short-term results indicated it to be acceptable for BTAI in multiple trauma patients to avoid LSCA complications unless we fail to stop bleeding first. KU organized and coordinated the study design and wrote the initial draft of this manuscript. KU and TN contributed to data cleaning and interpretation of the data. HY and YM reviewed and modified the manuscript. All authors read and approved the final manuscript. All the authors report no sources of funding. Written informed consent of the clinical details and clinical images for publication was obtained from all of the patients.